Make Space: Get More From Your Kitchen! We all are trying to gain more cabinet space/counter space. How do we do that without going into debt? What if we can’t spare the room? What if we can’t add on? What if tearing out cabinets isn’t an option or adding more? How do we gain more…? 1 x 4’s … I measured the length of the counter this shelf would sit on and cut accordingly. Drill holes counter sinking each one. I then used wood screws to screw it together. Sanding the wood before screwing it all together is much easier than doing it after, which I did…Here, I’m sanding/smoothing the screw holes as there are always burrs left over from drilling. Turn on the lights! It fits the space just right. I some gained serious space…Like whole two shelves in that cabinet! This was a total win-win. I’ve freed a cupboard and gained a useful shelf that makes it super easy to get to ingredients I use daily. No more pulling jars out to see what’s behind. Very convenient! I’ve prepared dishes and rolled dough on this counter and haven’t missed those four inches! Figure out what it is YOU really need from your kitchen. Remember the blog post on the coffee cups here? Whatever your needs are, more than likely there is a way to make your kitchen space more usable for YOU. An organized kitchen that works for your lifestyle makes all the difference in creating those wonderful dishes you make with love! I’m looking for suggestions….should I stain this shelf or whitewash it? I hope this gives you some ideas to making your own space work for you! Remember, if I can do it, you can do it! If you know someone who this post would benefit, please share/follow. I so appreciate you and thank you in advance! Recycling a drum set no longer being used. Remember the post on DIY Dog Bed; I made it out of an old drum set? Well, this nightstand is made from more of that same set. This is also a great way to “store” drums. Nostalgia says, “Don’t get rid of it!” And besides, you never know when you might want to play them again. Just for old times sake! Isn’t the grain of the natural wood beautiful? My son lovingly refinished it. This was his first set given to him when he was five! The snare is at the bottom. Makes for a nice sturdy base. Can you see the iPhone charger? Very handy! Nightstands can be made from many things; A cute wooden chair, old suitcases piled up one on top of the other, stacks of books, magazines, wooden crates, and even an old drum set! Let your imagination soar! Now, go create your own unique nightstand! Compressor. Lugging this guy up two flights of stairs wasn’t easy. 47 pounds of awkwardness! Nail gun; This needs to be hooked up to the air compressor (pic above) to work. I wasn’t sure if I needed this to help me hold the wood as it was just me building this. I ended up not needing it. I measured the space and cut the wood. 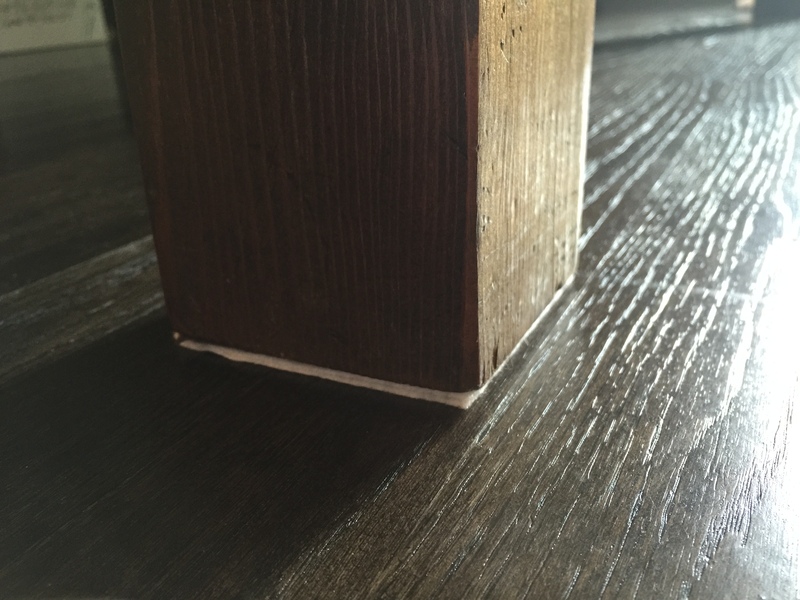 Cleats are 1×1’s, front facing pieces are 1×2’s and the shelf itself are 3/4″ plywood. I bought furniture grade as I wanted pretty wood and very straight pieces to work with. Using a chop saw I cut the cleats and facing pieces. For the plywood I used a skill saw. You can ask a person at your local wood store to cut them for you. Some places charge per cut, but some do it out of the goodness of their hearts! Using the stud finder, look for a stud. As you can see, my stud finder lies! No worries though, it will be covered by the cleat. Eureka, I found two studs! I attached the back cleat first. Double/triple checking the level. Then I attached the side cleats. First shelf done. Checking the level. As I finished each “cleat” section I added the shelf board so I could accurately measure the space I wanted in between each shelf. The ladder needed to come into play for the top two shelves. Being short has its downfalls, but it’s a good thing I can climb like a monkey! I didn’t want to risk splitting the wood, so I predrilled tiny holes using 1/16th drill bit. Carefully I nailed finishing nails across. Four nails along each piece. Using the nail punch, tap each nail in about a millimeter. Fill with wood putty to disguise the hole! Tip: You can make a wood filler using wood glue and fine sawdust! All done. 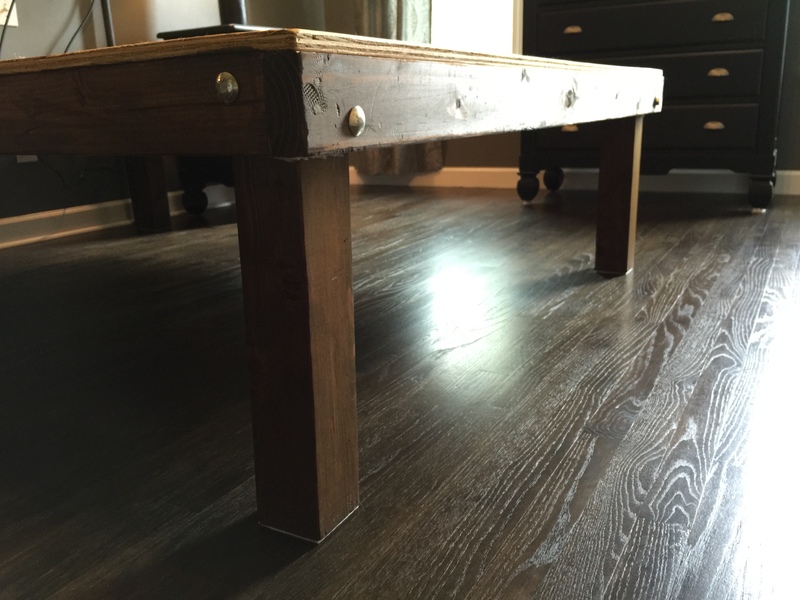 You can stain and seal using poly urethane. I like the natural look so I won’t be staining this. This would be great for folded sweaters, jeans, extra blankets, pillows, books, etc. I just added a quilt to finish off the seating area. Now this awkward space is a pretty space. I may sneak into my sons room to read in this “now” adorable nook! The view from that window is incredible! Make spaces work for you. If you can’t find just the right piece to make it work…don’t be afraid to build it! If I can, you can. I’m not a pro by any means, but I like to make things, so I try. I love all your comments. You make my day and I very much appreciate all your “likes” and “follows” and “shares”. Be well and HAPPY NEW YEAR! Remember the desk I repurposed? (see it here) The wall I’m referring to is the wall I see when I am creating at my desk. I had troubles doing anything with ugly holes staring back at me the whole time! I’m talking at least 20 unsightly holes! I took a shelving system down because something I am building will be in it’s place: Hopefully sooner than later, (waiting for my order to come in). Back to the ugly holes in the wall…I needed a quick fix. See how to “DIY” lampshade here. Great place to set my computer glasses! The string was something I had on hand. It was too thin so I braided three strands for a thicker “rope”. Seeing a wall full of this was not very inspirational. Tip: You need a nail and a hammer…But keep in mind you want the nail you use to be thinner than the screw, otherwise the screw will not have something to bite into. Tap the nail in (Not too far. Just a few taps will do.) See the hole near the right side of the nail? Tapping in a pilot hole helps to guide the screw in. Just screw in the screw! If you have an unsightly wall, you can fix it fast, by using an old door, new door, shoji screen, even a lovely quilt. This quick fix allows me to breathe easier seeing something pretty until I can get to repairing it. Mouse over the pics below to see the caption…Something I didn’t know! Found out accidentally! Teehee! The antlers are not real! 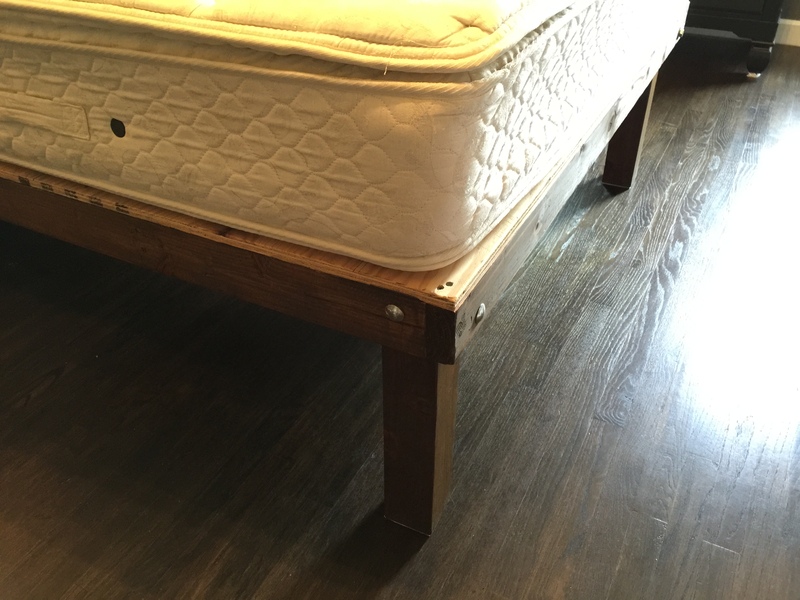 If you can’t find a bed frame that you like…build it! 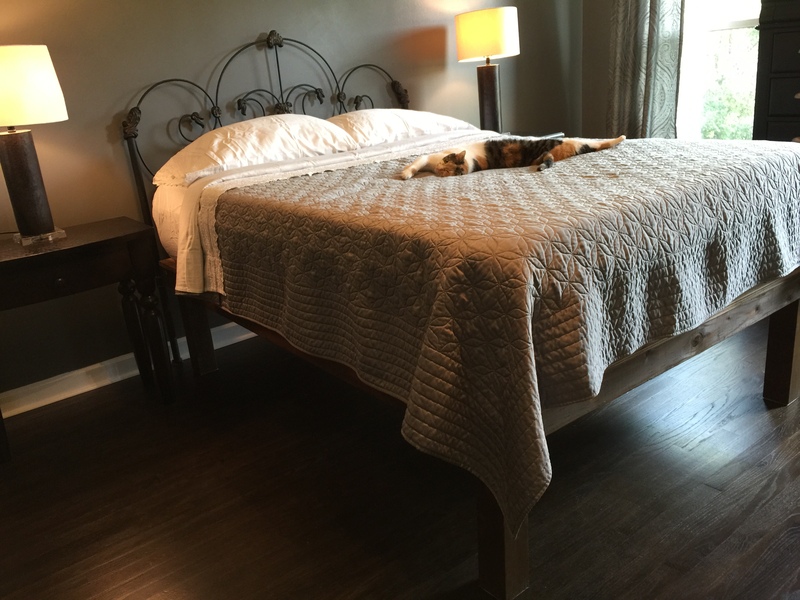 I’ve never found a bed frame I was happy with. 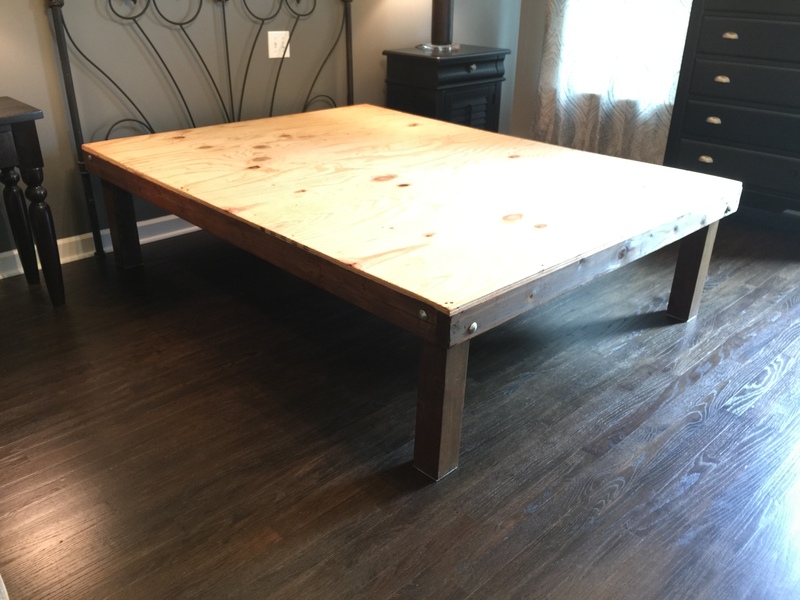 It started with making bed frames for my kids at all stages of them growing up. I wanted them to have as much play space as possible because every kid needs space to make epic Lego scenes or twirl around to their heart’s content, am I right?! So their beds were built up high so they could play underneath (ie; camping reading nook etc.) and as they got older, desks were built-to-suit to fit nicely under. 3/4″ Plywood: 2 sheets, depending on what size frame you are building. 4×4’s Legs: However long you need, buy accordingly. 2×4’s Sides, top and bottom of frame: However long you need depending on building for twin or queen or king. Also 2×4’s for the underside of the frame for support. (see photos below). Hex nuts for the carriage bolts = 8, one per bolt. Washers = 8, one per bolt. “L” brackets for support on the underside of the frame. 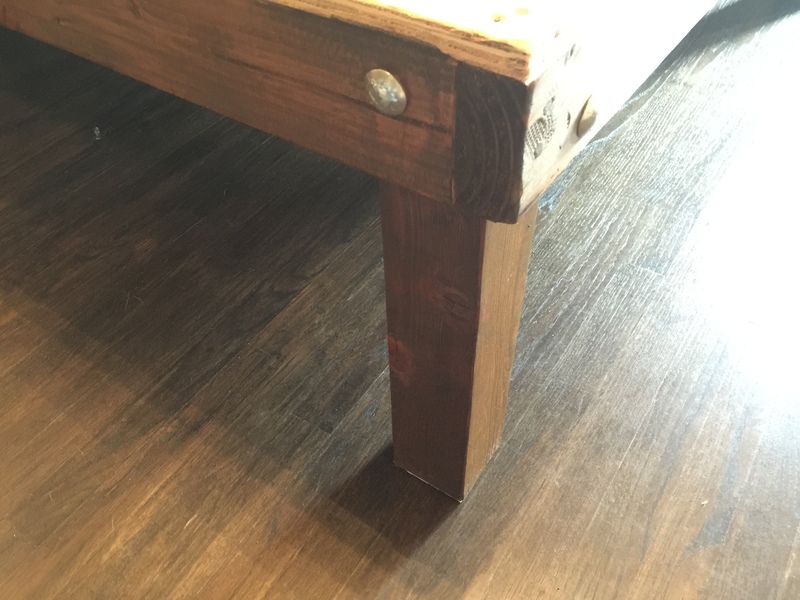 Felt for each feet to prevent scratching of your wood floors as well as a buffer between the 4×4’s and the 2×4’s (see picture below). Wrench – Proper size to use on hex bolts. Drill with proper size drill bit to drill holes. Also, drill for screwing screws into 2×4’s. 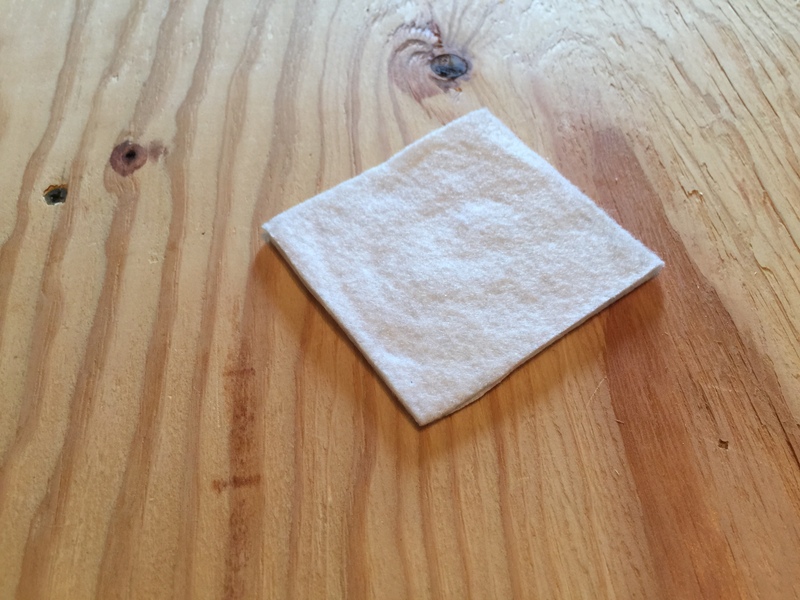 I want to start off by introducing this tip…This is felt. I buy it by the sheet and cut it to suit. I use them under most furniture to help me move them around the room without needing any help whatsoever! How cool is that!? The basic build is to first figure out the height you want the frame to be. Don’t forget to account for the measurement of the plywood on top. In this build I used 3/4″ plywood. I used 4×4 for the legs. I wanted the chunky look, plus it’s very sturdy. I measured for the height and cut the 4×4 using a chop saw. Measuring out for a queen size I measured and cut 2×4’s for the frame to go around the entire bed. You can screw or nail the 2×4 together creating a “box”. To attach the legs onto the 2×4 “frame” you can use trigger clamps to hold the 4×4 into the corner so you can pre-drill for the carriage bolts. I pre-drilled one hole per side corner off setting them so one is closer to the top on one side and one is closer to the bottom. I drilled through the 2×4 into the 4×4 all the way through! After the holes are pre-drilled I inserted the carriage bolt. This is where the hammer is needed to pound the bolt through. Once the bolt is through I used a washer and then a hex nut to secure the 4×4 in place. Before I go on I want to mention: Before the legs are set into the corner, I cut felt to put in the corner before I placed the 4×4 leg. The felt is to prevent the wood rubbing against each other. 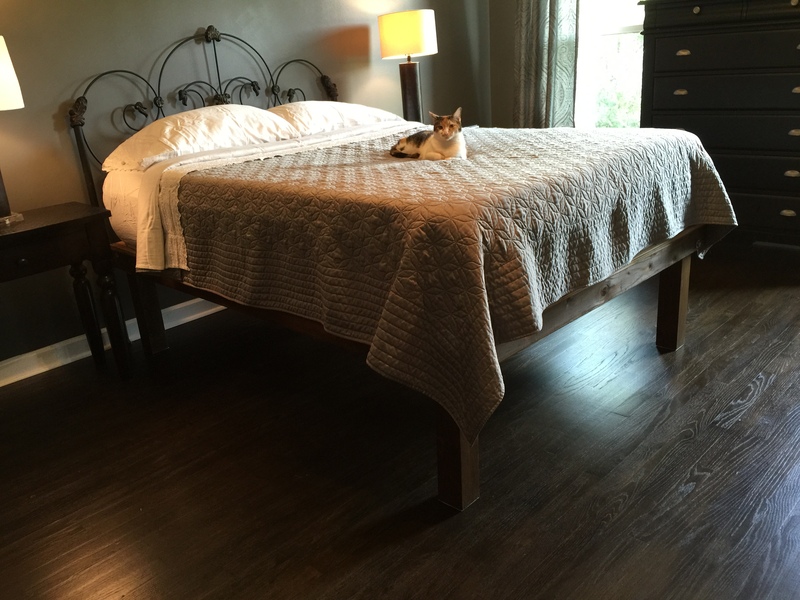 What do you think of the floors? It took me a day and a half to lay the wood and one day to stain and seal. A walk through post about the floors coming: please stay tuned! After the legs are bolted in place, I cut the plywood to fit using a skill saw. Drill the plywood into the 2×4 sides. Here you can see the felt in places where the 4×4 would touch the 2×4 sides. And you can see how I’ve off set the bolts. Here you can see I’ve run 2×4’s across the underside of the frame. This is for support. I also used “L” brackets for more support. At this point you can leave the wood natural, paint it, or stain. I chose to stain it. I had left over stain from doing the floors. I just rubbed the stain in and let dry. I then did one coat of water based poly on it. If you have trouble finding 4×4’s you can use 2×4’s for the legs using 2-2×4’s in an “L” fashion. When building a high frame such as a bunk bed style on top and say a desk area under, use 2×4 supports on three sides. And for the ladder you can add more 2×4’s for the rungs. Buy untreated wood only. You don’t want pressure treated! Some stores don’t carry untreated in the stores, but may be able to order it. ASK! 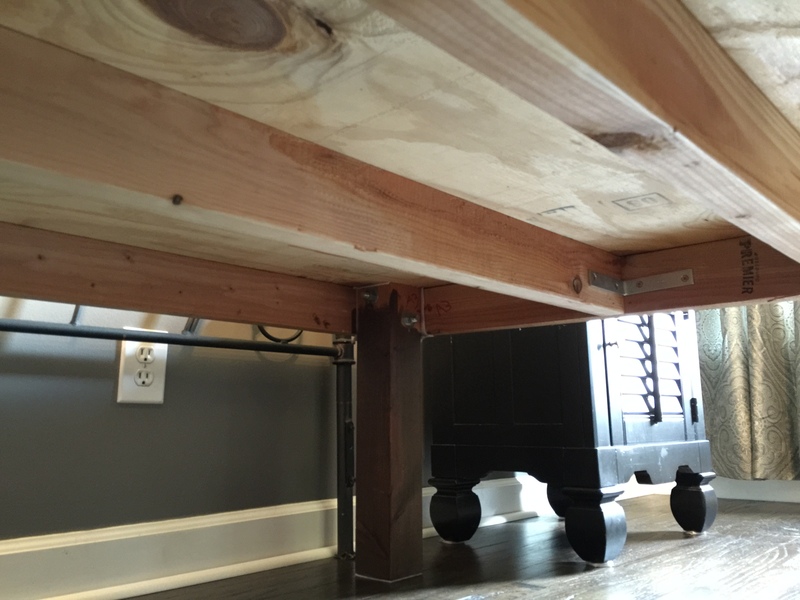 If you can’t find the right bed frame…build it! If you want to see what I’m up to, follow me on instagram or twitter. I put up different things that don’t always make it onto the blog. I wrote a post here… about building a convenient hall shelf somewhere, anywhere; this post is showing you that I’ve added hooks. It made the shelf even more “convenient”. Those headphones you see pictured have been sat down and misplaced more times than I can count. I use them all the time when vacuuming and mowing the lawn. Okay so I mentioned that I wanted to add these dragonfly hooks that I had. Well I did. I had actually done them awhile back and never posted, but you know how life is…? I really like the added detail. It really pulls it all together. Makes for a great spot to hang my purse or a dog leash or just nothing at all. And yes it does make me smile every time I walk past! Convenient Hall Shelf…Where did I put my keys? Simple shelf anyone can incorporate into any space. In my front door entry way there is a long hall that leads into the kitchen. There is a 1/2 bathroom on the left side of this hall and on the right there is a small closet and stairway leading up to the bedrooms, game room, bathrooms, etc. The countersunk screws are just above the orange dots you see in pic. 2nd pic you can see the countersunk screws; I used 3. If you have a challenging space that just needs a shelf, give this one a try. You can also use a wider top board such as a 1×8. Remember to find studs in your wall to drill into. They do make these (see picture below) cool wall anchors, but I wouldn’t use them for an entire length of shelf. It could work if you found two studs to anchor shelf into and if you need one more hold, then these wall anchors can do the job. 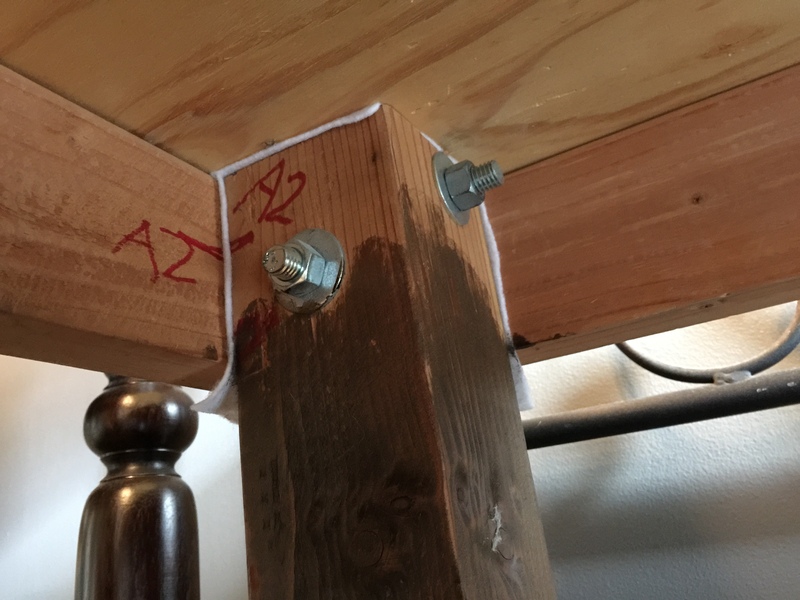 I try to always have at least two screws into wall studs; depends on how long the space is and how much weight you will put on it. *Never use these wall anchors in the ceiling! One thing to have a shelf fall, but not something from above! Find studs! Have I made my point 😉 ? Also remember my previous post…an organized home is a happy one. Shelves can really help you in that department. This would be great in a closet or awkward space too! Please like, follow and share…your support means the world to me!